Studio Carry On Harry , Singapore invited guest from Sydney Australia ,Declan Edwards who is an Author, Confidence & Purpose Coach,Entrepreneur & Keynote Speaker to talk about his expertise in the field of understanding our level of confidence and how to build it further from where we are today. What makes the difference between people who flourish and thrive in life compared to those who simply survive and ‘get by’? What are the differences between people who are confident and those who struggle with self-doubt? How is it that some people live with a clear sense of purpose whilst others live out their life feeling, for lack of a better word, lost? These questions have fascinated Declan for his entire adult life and have led him to seek out, study, and learn from some of the brightest minds in the fields of Personal Development and Positive Psychology. 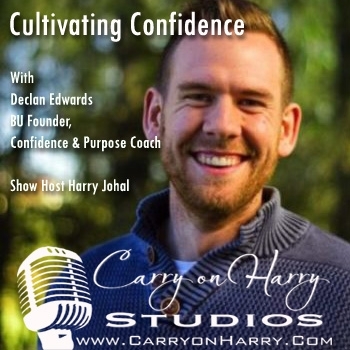 Declan now intertwines these evidence based practices with his personal experience as an author, Coach, keynote speaker and the founder of BU Coaching - an online company that empowers people to overcome self-doubt, cultivate self-confidence and live a life of purpose. Since 2015 Declan has spoken for a range of businesses, schools and organizations on how people can overcome self-doubt, cultivate selfconfidence, develop a sense of life purpose and begin thriving in life. The logos of some of these businesses, and organizations, are included below. Stay Tuned for a great educating session about Building Confidence on the Show Carry On Harry . You Can Avail Special Discount with Cupon Code "Carry On Harry" for the programs offered by BU Coaching.